LONDON, Ont. - The impact of lower oil prices and how much they will hurt Canada's economy remains unclear, but last month's surprise rate cut gives the Bank of Canada time to figure out how best to steer the country back toward stability, bank governor Stephen Poloz said Tuesday. 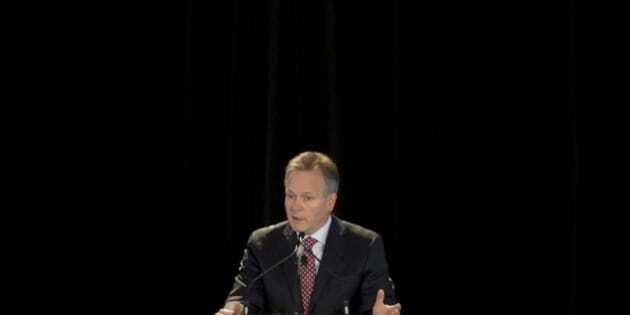 "The oil price shock itself is of uncertain size," Poloz said in the inaugural president's lecture at London, Ont. 's, Western University. "So, the downside risk insurance from the interest rate cut buys us some time to see how the economy actually responds," he said. The quarter-point rate cut, which reduced the central bank's overnight rate to 0.75 per cent, has given policy-makers more confidence the economy should be back on a more sound footing by the end of next year, rather than some time in 2017. "And it will cushion the decline in income and employment, as well as the rise in debt-to-income ratio, that lower oil prices will bring." Still, uncertainty remains because while the oil price shock hurt the economy almost immediately, taking advantage of a lower Canadian dollar to boost exports, and increased consumer spending on things other than lower-priced fuel, will only happen gradually, said Poloz. And he warned that lower oil prices mean lower Canadian income, which will worsen the household debt-to-income ratio. One lesson Poloz and other central bank leaders have learned from the recent recession is that interest rates are not very effective in mitigating economic crises. That said, real interest rates are likely to remain relatively lower than in the past for some time to come, largely as a result of the aging population, Poloz said. "We have learned that interest rates associated with two per cent inflation leave very little room to manoeuvre in response to large shocks," he said. "Furthermore, we know that the so-called neutral real interest rate will be lower in future, for demographic reasons in particular, and this will reduce our manoeuvring room even more." The Bank of Canada's next interest rate announcement is March 4 and many economists predict the central bank to cut its key rate by another quarter of a percentage point.